The long-closed thrift store on Santiam Road. If the Albany planning staff has its way, there won’t be a Bottle Bill redemption center where the Oregon Beverage Recycling Cooperative wants to put one. So let’s hope the staff’s reservations can be overcome. 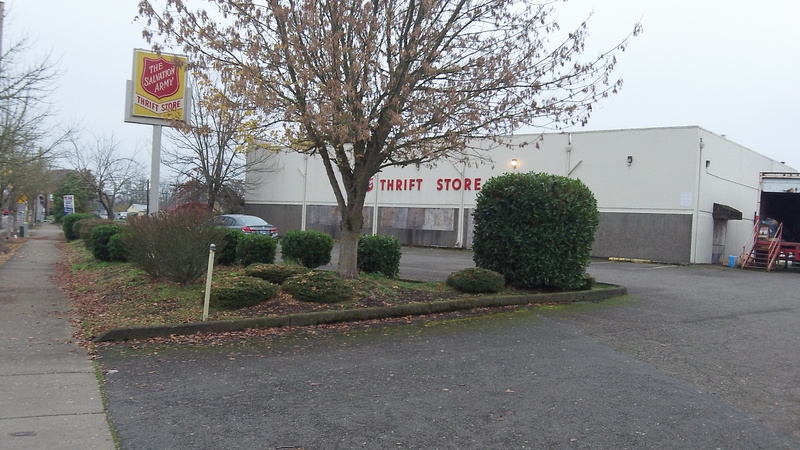 The recycling cooperative has asked the city to amend the zoning code to allow a redemption center for bottles and cans in the long-vacant Salvation Army thrift store on Southeast Santiam Road. The city staff is against it on the grounds that the area is zoned for a mix of neighborhood commercial uses. The staff fears the redemption center would draw people from all over the area, destroying the area’s neighborhood feel. What neighborhood feel? Santiam Road is a thoroughfare, a shortcut to avoid Pacific Boulevard and downtown. The nearby skatepark already draws young people from all over. The boarded-up thrift store is a depressing eyesore. The central location is ideally suited for a redemption center because under state law all Albany supermarkets could make use of it (though Walmart only partially because it’s more than two miles away). The redemption center would allow consumers to save up their returnable containers and drop them off for a credit once every few weeks or even months. No more waiting at those slow and often balky redemption machines. That’s especially helpful to school groups doing bottle and can drives to raise money. Ah, yes. The same type of “refusal to adapt” planning nonsense made famous by Detroit. Not having a car means I’d have to go a mile each way simply redeem my returnables. The grocery stores are NOT in that direction! With the current system, I can take a small amount of returnables on my shopping trip and redeem them with no additional effort. Like others, the machines can be slow, although often because of the users. That’s just a matter of demanding better service from the stores. As far as “charitable groups” wanting to handle large quantities- There ARE some stores that allow you to take in bags of 100 with a pre-arrangement. Can someone give more details how the redemption center will function? Will there by an employee (more jobs?) to take my bottles and cans? Who bears the costs of operations? Will grocery stores still accept cans and bottles as in the past? I’ll be looking for more info here on Hasso’s site. .
More info coming up shortly. “Salem, OR – The newest BottleDrop Redemption Center will open in north Salem on October 3, 2013. The new facility, operated by Oregon Beverage Recycling Cooperative (OBRC), is located at 1917 Lancaster Dr. NE, Salem, OR. BottleDrop will allow area consumers to redeem their bottles and cans quickly and efficiently in a fully staffed facility seven days a week from 9:00 a.m. to 6:00 p.m.
• Hand Count- Staff will count up to 50 containers per day. • Self-Serve- New reverse vending machines will accept up to 350 containers per day. • EZ Drop System- Fill pre-labeled bags with deposit containers and drop off 24 hours a day. BottleDrop staff will count and sort the containers. The cash value will be credited into an account which can be accessed at participating retail store kiosks or any BottleDrop location. “BottleDrop Centers are operated and funded by OBRC in partnership with participating grocery retailers. Stores within 1.5 miles of the new redemption center will no longer be required to accept deposit containers after October 9th. Grocers within 2.75 miles of the facility will accept a maximum of 24 containers per day. • Food-4-Less at 3695 Devonshire Ct.
• Roth’s at 702 Lancaster Dr. NE. • Winco Foods at 1240 Lancaster Dr. SE. “The Oregon Liquor Control Commission, which governs the Oregon deposit law, unanimously approved the statewide rollout of the BottleDrop Redemption Center concept based upon success of three pilot redemption centers in Wood Village, Oregon City and south Salem. OBRC has recently opened a 4th BottleDrop facility in NE Portland and plans to open additional locations in Gresham, Bend and Eugene within the next six months.